Tuesday night December 2nd is the first night of the Jewish Festival of Hanukkah and twenty-two days later is Christmas Eve. America is supposed to be a “melting pot,” however a sad thing about the end of the year holidays is that most Jews do not understand Christmas…and most Christians don’t get Hanukkah. Since both holidays begin in less than two weeks, as a public service it’s time for me to explain the difference between the two (in the usual Lidblog snarky way, Below are 18 difference between Christmas and Chankuah, all of it true (IMHO) some of it snarky. Why 18? Because in Hebrew the number 18 is represented by the same letters that spell out Chai—life. 1. Christmas is one day, same day every year, December 25 based on the secular solar-based calendar. Hanukkah is tied the Hebrew LUNAR calendar, it begins on the 25th of Kislev every year. However, the 25th of Kislev falls out on a different day of the secular calendar every year.Most Jews never know when that day falls on the secular calendar until a non-Jewish friend asks when Chanukah starts. That question forces us to consult a calendar provided free from the Kosher butcher or the local Jewish Funeral Home. BTW the Jews also celebrate December 25th. Why not….it’s a paid day off from work. So as the video below explains we go to movies (there are no lines because the Gentiles are doing something else). After the movies, we make our annual Christmas pilgrimage to get Chinese food (a traditional Jewish food). Interestingly 2017 in the secular calendar is 4714 in the Chinese calendar and 5778 in the Jewish Calendar. Archeologists and historians still haven’t figured out how Jews ordered take-out for the first 1064 years of their existence. 2. There is only one way to spell Christmas. No one can decide how to spell Chanukah, Chanukkah, Chanukka, Channukah, Hanukah, Hannukah, etc. I like to use them all–even in the same post. 3. Christmas is a major Christian holiday. Chanukah is a minor Jewish holiday. Chanukkah is only a big deal in America because Jewish parents wanted their kids to be able to brag about getting gifts also. But that is a fabrication of Jews in America. Hanukkah isn’t mentioned in the Torah, it was created by Rabbis. Now that’s not necessarily a bad thing, but bigger holidays like Passover Sukkot, and Rosh Hashana for example, were designated by God. And God outranks the rabbis (a fact that some rabbis agree with). As a matter of fact, the books of Maccabees which tell the Chanukkah story aren’t even part of the Jewish canon. There are many suggested explanations for this, the best of which (IMHO) is politics. The Maccabees broke tradition and took over the offices of King and High Priest, breaking a tradition that was set during the exodus from Egypt when God designated Moses as the political leader and the line of his brother Aaron held the priesthood. When a monarchy was finally established it went to the house of David, and Aaron’s descendants remained the priests. Before you liberals start claiming biblical proof of separation of church and state, the reason for the biblical separation wasn’t a fear of religious influence on govt., but the possibility of a corrupt government’s influence on religion –which is exactly what happened with the Maccabee family (their real surname was Hasmonean, but more on that later). God knew that governments could become corrupt and since there were no bloggers in biblical times to watch over the government, the plan was for an incorruptible Priesthood who were supposed to keep the politicians in line. There were some believed that the Maccabees breach of tradition led destruction of the second temple in Jerusalem and exile of the Jews. When the canonical books were selected about 250 years after the Maccabee victory, and about 70 years after the destruction of the Temple and exile, feelings were still very raw and the Maccabees were booted. Feelings have calmed down but since there are no ancient copies in Hebrew (only Greek translations), the books cannot be added back into canon. 4 . Christians (and Jews) Don’t work on Christmas, Regular work schedules apply to Hanukah. Christmas is also a national holiday in the United States everybody is off. Because as Hanukkah is a minor Jewish holiday, work is permitted. Here’s a little secret for the Gentiles, if a Jewish employee tells you he/she has to take off for Hannukah (or Purim for that matter) they are full of Shi, I mean full of latkes. 6. Most Christians do not get upset if you wish them a Happy Hannukah, but many Jews and most atheists get upset if you wish them a Merry Christmas. “Happy Holidays” is a stupid PC term. Technically it can refer to July 4th, Thanksgiving, or a Satanic holiday. If you are not Christian and somebody wishes you a Merry Christmas, grow up! It’s the thought that counts (and who knows maybe they will buy you a present). 7. Christians get wonderful presents such as jewelry, perfume, stereos. The traditional Jewish gift is Chanukah Gelt (coins made from chocolate). Since the increase of type two diabetes and the protests about childhood obesity, many Jewish kids are feeling left out because they aren’t getting good stuff like their Christian friends. But here in America Jewish kids get eight days of presents. Not all of the presents are stuff they want…some days they get practical presents such as pajamas, underwear, socks, shirts that make you itch when you put them on…or even scholarly Jewish books (which look great on their bookshelves). 8. Christmas is about “Peace on Earth,” Chanukah is about a civil war. Peace on Earth is a big theme of Christmas. Everybody –even non-Christians know this. It says it in almost all the Christmas carols. Chanukah is about a civil war against assimilation. The real Chanukkah story is not just a war against the Syrian-Greeks and throwing them out of Jerusalem and the Holy Temple, it’s about a civil war amongst the Jews. Judah Maccabee and the boys were fighting other Jews who had turned away from their faith by combining it with Greek/Hellenistic practices. The resulting assimilation caused a loss of Jewish faith and tradition, and eventually laws against practicing Jewish ritual. Sadly while Chanukah is a holiday about Jews fighting against assimilation, some ACLU-progressive-liberal types would have us celebrate it by assimilating “Menorahs” in nativity scenes, or putting trees in their homes have no understanding of the meaning of the holiday. A message to my Gentile friends, you have a nice holiday enjoy it–but don’t combine it with my holiday about assimilation. 9. Black Friday sales. Christmas Black Friday sales go on until midnight. Hanukah Black Friday sales end at least an hour before sunset so Jewish shoppers can get home for Shabbos dinner. Another holiday shopping difference on Black Friday, indeed during the entire holiday season…Christians pay whatever the price tag reads. Jewish theology teaches that paying the marked retail price is a mortal sin. 10. Christmas is a time of great pressure for husbands and boyfriends, their partners expect special gifts. Jewish men are relieved of that burden on Hanukah. Adults give each other cheap gifts just to teach the kids gift about giving. My father of blessed memory was a house painter. He used to get two wallets as gifts from the store he used to purchase his paint from. Every year my mother would wrap up the wallets, my dad would give one to mom and mom would give one to dad (we knew what they were doing but didn’t say anything). And for guys dating the same girl for a long time, Chanukah is much better, BUT no self-respecting Jewish woman expects a diamond ring on Hannukah no, they want to “double-dip,” jewelry on Hanukkah— and the diamond ring another day. 11. Christmas brings enormous electric bills-lights around the outside of the house..the inside, on the tree..etc. 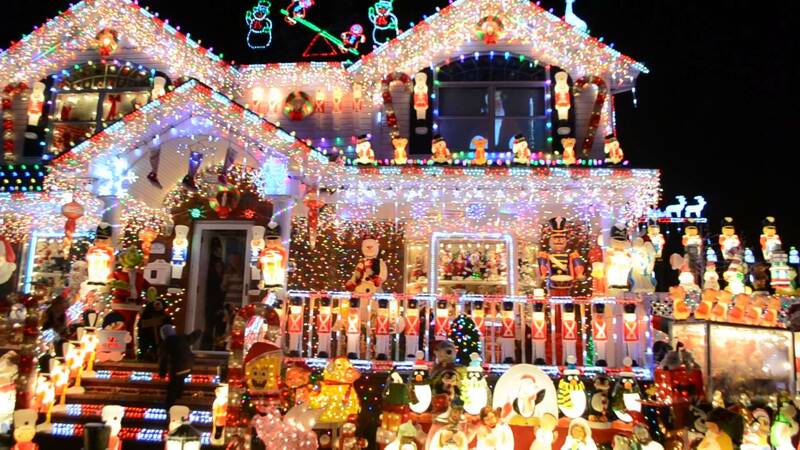 Trees are sometimes lined with popcorn on a string, but most of the time there are blinking lights, and some families create incredible displays on the outside of their houses. Hanukkah is a green holiday, it uses candles or oil. Not only are we spared enormous electric bills, but we get to feel good about not contributing to the energy crisis. We don’t give coal to the bad kids, it might make a mess of the carpet and the cleaning lady doesn’t come till next week. 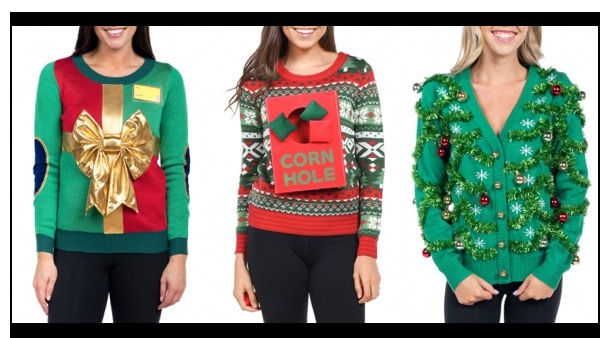 And as for the popcorn and candy canes on trees; waste food, are you kidding? There are children starving in Africa. 12. Christmas carols are beautiful because they were written by Jews..Silent Night, Come All Ye Faithful, etc. Most Jews are secretly pleased that many of the beautiful carols were composed and written by one of our tribal brethren, my favorite is White Christmas written by Irving (Isaac) Berlin. “Chestnuts roasting on an open fire,” and “I’ll be home for Christmas” were written by Jews also. And be honest don’t Jews like Barbra Streisand and Neil Diamond sing those Christmas songs beautifully? What I have an issue with is what the heck did these Jewish songwriters write for their own people? BO-ring! Most Chanukkah songs are about dreidels made from clay or having a party and dancing the hora. And God-forbid a famous Jewish pop singer record some Hanukkah song. All we really have is Adam Sandler playing Jewish geography. 13. A home preparing for Christmas smells wonderful. The sweet smell of cookies and cakes baking. Happy people have gathered around in festive moods. A home preparing for Chanukah smells of oil, potatoes, and onions. To remember the miracle of the one day of oil that lasted for eight days we eat oily foods, potato latkes, greasy jelly donuts, etc. Also during Hanukkah, Jewish homes are supposed to be full of loud people all talking at once (just like every time Jewish people get together). 15. Parents never withhold gifts to their children during Christmas. Jewish parents have no qualms about withholding a gift on any of the eight nights Hannukah, and they don’t blame a fat bearded guy in a red suit and a sleigh pulled by reindeer either. Jewish parents take credit for their children’s suffering just to remind them who is the boss, “That’s it I am returning your Chanukah toys!” They will also find a way to make the kids feel guilty about it. “Great! Now I have to wait in a long line to return you Hanukkah gift!” The Catholics may have invented guilt, but we Jews learned to market it much better. 16. The players in the Christmas story have easy to pronounce and spell names such as Mary, Joseph, and Jesus. The names in the Chanukkah story are Antiochus, Judah Maccabee, and Matta… whatever. By the way, the Maccabee’s last name was not Maccabee, it was Hasmonean. Maccabee is a nickname meaning hammer and is an anagram for a Hebrew phrase, “Who is like you oh Lord.” But in the end doesn’t really matter what their names are, no one can spell it or pronounce them anyway. On the plus side even if we don’t know the names of the players in the Chanukah story it doesn’t matter. Everyone knows we can tell our Gentile friends anything with a lot of guttural “cchh” sounds and they will believe we are wonderfully versed in Hebrew and Jewish history. 18. 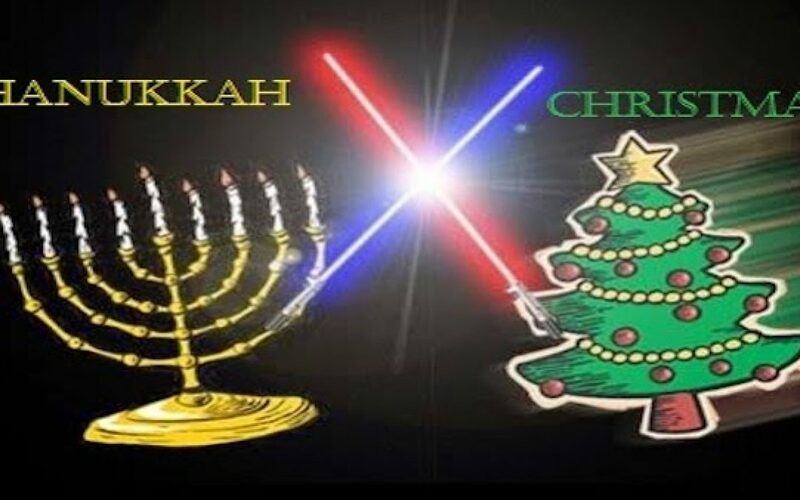 Hanukah movies are easier to identify, Christians fight over whether some movies are Christmas movies. If you ever want to purposely start an argument, walk into a room full of Christians and ask “Is Die Hard a Christmas movie?” Christmas is a big part of the American culture so many movies occur during Christmas so there is a disagreement whether or not a particular film can be considered a Christmas Movie. Even the movie Ted about an oversexed, cigar smoking, cussing teddy bear, is about a Christmas wish that is granted (see above). But with Hanukah movies, there is no grey area, perhaps because there are so few Hanukah movies. Adam Sandler’s “Eight Crazy Nights” is a Hanukah Movie, so is “The Hebrew Hammer,” and “The Rugrats Chanukah,” but that’s about it. Chanukah and Christmas are totally different holidays with totally different meanings but whichever one you celebrate…I wish you all a joyous holiday surrounded family and friends. And may God fill the coming year with love, good health, and peace.